From left: Exhibition curator, Dr. Yoel Rappel; Israel's Minister of Immigrant Absorption (speaking), Sofa Landver; Limmud FSU Founder, Chaim Chesler; and Russian Chief Rabbi, Avraham Shayevich. 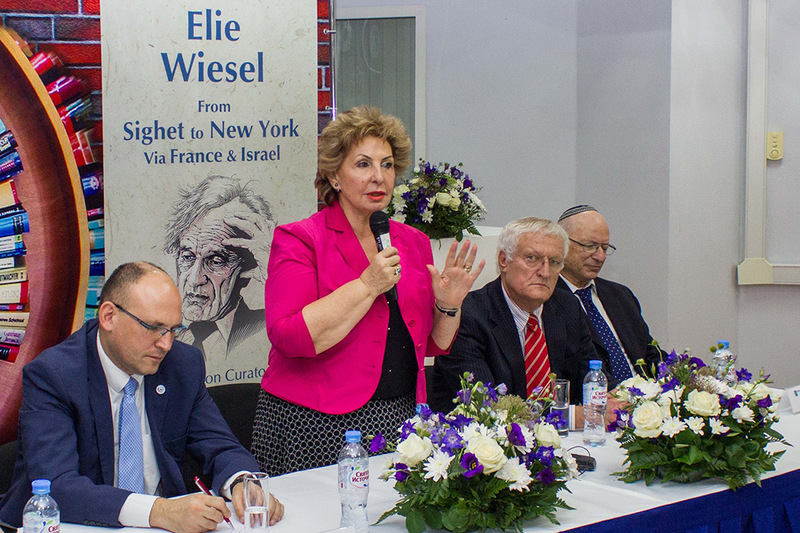 MOSCOW - Limmud FSU, in partnership with the Shem Olam Institute and the Nativ organization, today opened a photographic survey of the life of Elie Wiesel, at the Israeli Cultural Center in Moscow. The exhibition will run until the end of September. An array of VIPs participated in today's opening, including Russian Chief Rabbi Avraham Shayevich; Russian Jewish Congress President Yuri Kenner; Israel's Minister of Immigrant Absorption Sofa Landver; Conference of European Rabbis President Pinchas Goldschmidt; Euro-Asian Jewish Congress Secretary General Mikhail Chlenov; Israeli-Russian Business Council Chairman Dr. Temur Ben Yehuda; Prof. Ilya Altman, representing the Claims Conference in the FSU; American Jewish Joint Distribution Committee's representative in Moscow, Alik Nadan; and the founder and chairman of Limmud FSU, Chaim Chesler. Wiesel was a leading supporter of the movement to free Soviet Jewry and in 1966 wrote a highly influential book on the struggle. It's fitting that Elie Wiesel was honored in Moscow by the very people he helped free 50 years after writing 'The Jews of Silence,'" said Chesler. "His memory will serve as an inspiration and a symbol of our triumph." Dr. Yoel Rappel, the founder and director of the Elie Wiesel Archive at Boston University, curated the exhibition, which showcases milestones in Wiesel's life, from his youth before and during the Holocaust to his work as a novelist, journalist, Jewish leader and Nobel Prize winner. When I asked Wiesel how the struggle for Soviet Jewry is more important than the struggle for Holocaust awareness, he replied: "the Jews of Europe were exterminated physically by the Nazis; the Jews of the Soviet Union were being destroyed spiritually. The first we were unable to avoid, but we must prevent the second from succeeding," said Rappel. Wiesel was born in 1928 in Sighet, Transylvania, now in Romania. He was just 15 years old when the Nazis deported him and his family to Auschwitz. His mother and younger sister perished, yet his two older sisters survived. Elie and his father were later transported to the Buchenwald concentration camp, where his father died shortly before the camp was liberated in April 1945. "Elie Wiesel, an Auschwitz survivor and Nobel Peace Prize winner, was a source of inspiration for Jews around the world - and all free people. A philosopher, teacher, journalist and writer, he embodied the struggle against evil and for the right of Diaspora Jews to immigrate to Israel," said Landver. "There is no one who will be better remembered as a fighter for humanity. Wiesel managed to break through the Iron Curtain and allow many Jews to return to the Jewish homeland." In 1978, U.S. President Jimmy Carter appointed Wiesel as chairman of the President's Commission on the Holocaust. In 1980, he became the founding chairman of the U.S. Holocaust Memorial Council. Wiesel and his wife Marion established the Elie Wiesel Foundation for Humanity, to combat indifference, intolerance and injustice. He received 140 honorary degrees from institutions of higher learning all over the world. Elie Wiesel died in New York in July. The entire exhibition may be viewed or downloaded here: https://db.tt/Sez5wUka. Attached please find photos from the exhibition's opening in Moscow. Photo Credits: Courtesy of Sofa Landver. Limmud FSU is a nonprofit founded 10 years ago by Chaim Chesler, former treasurer of the Jewish Agency, and Sandra Cahn, a philanthropist from New York. Since its inaugural conference in Moscow in 2006, Limmud FSU has created an independent educational and communal network of annual conferences and festivals, attracting more than 35,000 participants in Russia (Moscow, St. Petersburg, Russian Far East and the Volga-Ural region), Ukraine, Moldova, Belarus, Israel, North America (Greater New York, the West Coast, and Canada), and Australia. Limmud FSU engages young Russian-Jewish adults, empowering them to take ownership of their identity and to connect with their communities through pluralistic, egalitarian volunteer-driven conferences of Jewish learning and culture. In this way, Limmud FSU strives to foster the next generation of young Russian-speaking Jewish leadership and so revitalize Jewish communities in the countries of the former Soviet Union, and in countries with Russian-Jewish communities, wherever they may be. Key partners include the Claims Conference, JDC, philanthropist Matthew Bronfman, Aaron Frenkel, Michal Grayevsky, Ronald Lauder, Diane Wohl, the Jewish National Fund (KKL), UJA-Federation of New York, Israel Bonds, the Jewish Agency, and others. For additional details: www.limmudfsu.org.